To meet the needs of adults and teens learning to swim, improving their fitness or staying active in the water, the Red Cross has designed three programs that teach swimming (Red Cross Swim Basics), develop or improve strokes (Red Cross Swim Strokes), and sample a variety of aquatic activities (Red Cross Swim Sports). 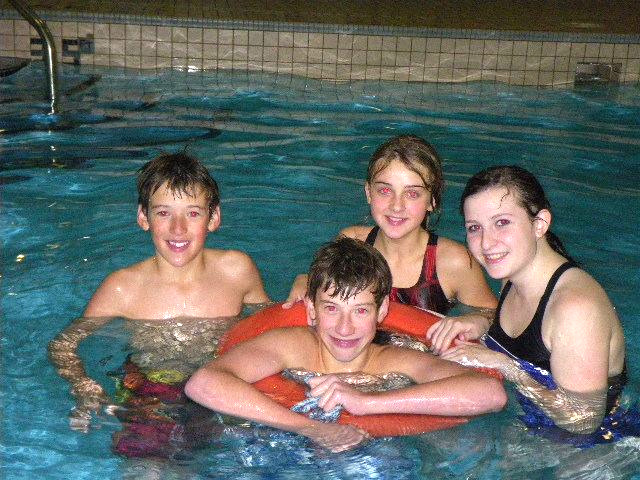 The programs can be customized to meet swimmers' individual goals and rate of progress. The personalized approach for stroke development is suitable to teen and adult learning styles. Developing comfort in the water through basic flotation, movement and breathing skills for shallow and deep water. Swimmers will be able to successfully swim a 3 x 5m front swim upon completion of Red Cross Swim Basics. Strokes are chosen in consultation with the instructor and developed according to the Red Cross Swim Kids progressions and performance criteria. The water safety instructor assesses incoming stroke ability and sets goals with swimmers for distance and stroke development. The Red Cross Swim Sports modules are designed as an "aquatic sampler" that introduces swimmers to some of the fundamental skills of a variety of sports such as boating, diving, lifesaving, surfing, boogie boarding, workouts, synchronized swimming, triathlon training, underwater hockey and water polo.